Looking for drills for [tag]basketball handling skills[/tag]? You’ve come to the right place! Try out these ideas below that Alex sent to me and let me know how it goes for you. Being that my daughters and my son are between the ages of 6 – 11, I deal with a lot of kids that are just plain scared. Scared of the ball, scared of body contact, etc… I use a [tag]one-on-one[/tag] [tag]basketball[/tag] [tag]drill[/tag] to try to over come some of the fear. I assign a number to each player. I call out the numbers and then I toss the ball down the court. 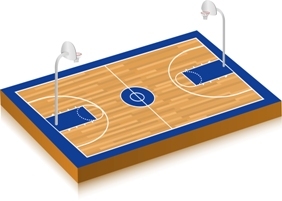 Player who gets to the ball first is offense and the other player is defense. The player that allows the other to score runs a lap. Players are facing one another..1 player has the ball right behind at their feet with their hands behind their backs. The other player attempts to get the ball. The defender must protect the ball with their body. A poor effort results in running.